Carlos II. C. Coello. Museo del Prado of Madrid. King of Spain, born 6 November 1661 in the old Alcazar of Madrid and died in the Palace of November 1, 1700. He/She was the son of Felipe IV and his niece, Doña Mariana of Austria. The death of Felipe IV in 1665 raised the problem of the Regency, as his heir, the future Carlos II, just was four years old. The probate of the deceased King gave up the governance of the realm to Doña Mariana of Austria, advised by a Governing Board composed of the Presidents of the Councils of Castile and Aragon, the Grand Inquisitor, the Archbishop of Toledo and a great of Spain. This solution away from the power to don Juan José of Austria, a natural son Felipe IV had famous comedy María Calderón, la Calderona actress. Carlos II was a weak and sickly child who survived barely a childhood of continuing ailments. Only extreme care of his mother and his nurse, María Engracia de Toledo, made it possible to overcome their early years. This physical weakness, along with a stunting of intelligence bordering on the idiocia, have been traditionally attributed by the historiography, with few scientific grounds, to the excesses of marriage consanguinity between the Habsburgs. The nuncio papal Millini has bequeathed us an expressive description of Carlos II: "the King is rather low to tall, skinny, not ill-formed, ugly face; It has a long neck, long face, Chin long and as stooped upwards; the typical lower lip of the Austrias; not very large eyes, turquoise blue and thin and delicate cutis. Look with melancholy and a bit amazed expression. Hair is long and blonde, and carries it combed backwards, so that the ears are exposed. You can not straighten your body but when walking, to less than to pull up to a wall, table or anything else. Your body is so weak as his mind. Occasionally shows signs of intelligence, memory and certain vivacity, but not now; usually it looks slow and indifferent, looking dumbfounded. It is can do with it whatever you want, as it lacks his own will ". His intellectual capacity seems to have indeed been scarce, perhaps due to the carelessness that is educated him more than a true mental disability. The King received a poor education, partly because of the carelessness of the Queen Mother, in part by the poor choice of their tutors, among which highlighted the intriguing Ramos del Manzano. King from the age of four, to nine Carlos couldn't read or write, which caused great scandal in the Court when it was learned. Mariana of Austria, female little avezada to the Affairs of State, supported from the beginning of his Regency in her confessor, the German Jesuit Everardo Nithard, to whom the Queen exalted to the position of Inquisitor General and member of the Board of Governors since 1666. The rise of an alien soliviantó the minds of the nobility and favored the aspirations of don Juan José de Austria, which does not want to see in power. The disasters of foreign policy symbolized by the peace of Aachen imposed by France after the call war of return, and the internal instability served the purposes of don Juan José, who from January 31, 1669 went from Aragon in direction to Madrid, which, together with the hostility of the Board toward Nithard, led to the fall of this. Neither then don Juan José was admitted to take charge of the Government, thanks to the influence of the Queen Mother, enemy of him, he/she exercised over his weak son. A new private of the Queen, Valenzuela, then began a brilliant political career that made him the most influential character of the Court. The testament of Felipe IV established that Carlos II would take the reins of power at the age of 14, i.e. in 1675. At this point, the Regent sent a letter which explained that, given the delay of their education and their physical weakness, it was necessary to maintain the Regency even during two years his son. Surprisingly for Doña Mariana, his son refused to accept such amendment and claimed his rights as King, apparently at the instigation of his closest henchmen, led by their confessor, Montenegro, and by his brother don Juan José, had warned that to prepare in the outskirts of Madrid. The Queen Mother once again exercised his ascendancy over the King and got it accepted don Juan José de Madrid away, and send it to Aragon. Doña Mariana and their valid Valenzuela found a compromise solution: the Governing Board was extended for two years, but in their meetings involving both the Governor Queen and his son. However, the Board was reduced to two members: Villaumbrosa and Navarra, which sought to move from power to Valenzuela, while the Queen Mother would allow it more than momentarily. This middle way was broken in September 1676, when the followers of the Queen, after one season as captain general of Granada, was appointed Prime Minister and dissolved the Governing Board. The high nobility badly welcomed the appointment he/she considered an upstart and claimed the return of don Juan José de Austria, motion supporting the Council of State and the Castilla. Carlos II, for his part, also wished the return of his brother, which felt great affection. Given this, Valenzuela fled from Madrid and don Juan made his triumphal entry into the capital in January 1677. Valenzuela was arrested and the Queen Mother away from the Court. Don Juan José could then take over the Government of the monarchy for almost three years, until his death September 17, 1679. The new Governor should face serious problems. From 1673 crawled a bloody war with France, which joined the permanent internal instability and the pressing problem of the succession of Carlos II and his new marriage. Juan José achieved the peace of Nijmegen (September 1678) and started a finance reform which could not concluded by suddenly befall him death. The agreement of Nijmegen returned to Spain Messina, Puigcerdà and other Catalan squares, but Spain lost Franche-Comté, numerous important Flemish squares such as Valenciennes, Bouchain, Cambrai and Ypres. Since the death of don Juan José the apparent inability of Carlos II to govern itself handed power over to various Ministers, imposed by court factions at the weak will of the King. The Queen Mother, who from the entrance of don Juan in Madrid had been confined in Toledo, was again called to the Court by his son. The struggle for control of the power spread two courtiers parties: the addict to Doña Mariana of Austria, led by the Duke of Frias, and national party or donjuanista, headed by the Duke of Medinaceli. Finally, Carlos II chose as Prime Minister the latter, powerful man but little political capacity. The Duke of Medinaceli tried to continue the policy undertaken by don Juan José. But foreign losses (peace of Regensburg) and its irresolvable enmity with the Queen again provoked the fall of Medinaceli in 1685. This had been completely exhausted finances and was unable to solve the financial problems of the monarchy. These years were the most difficult reign due to the deep economic crisis and the plagues and famines that endured the Kingdom. Medinaceli implemented unorthodox methods to get money: money from individuals to the arrival of the fleet of the Indies, was seized which caused more than one incident, since one of those affected, the elector of Brandenburg, took his revenge, leading to the capture of two Spanish merchant in Ostend. There were also numerous riots, as the unions of shoemakers and bakers of Madrid and strike sit-in of the junior staff of the Palacio in 1680. Internationally, the Government of Medinaceli remained as inoperative as of his predecessors. Luis XIV, the great helmsman's European policy, impacientaba the prospect of taking over the Spanish domains and, under the pretext of non-compliance with the agreement of Nijmegen, took Courtrai and Dixmude in 1683. This led to a new declaration of war against France, despite the Spanish exhaustion. The war was brief and disastrous for the Spanish monarchy. The French army invaded Catalonia, reaching set site to Girona, as the real war unfolded in Luxembourg. French victories in the German front precipitated the signature of peace separated by the Emperor and the Netherlands, allies of Spain, in 1684. Spain was thus abandoned, and again had to submit to the French demands. The Treaty of Ratisbon of 1684 August handed France Strasbourg square for twenty years and total of Spain renounced Luxembourg, plaza that was the key to the defense of the Netherlands, in Exchange for the return of Courtrai and Dixmude. Medinaceli replaced at the head of the Government count of Oropesa, who remained in power until June 1691. The fall of Oropesa was this time work of the new Queen, María Ana de Neoburgo, the Prime Minister had defended the candidacy of a Portuguese Princess to marry Carlos II. Oropesa tried to establish reforms in the Administration and in the Royal House, passing through the reduction of Palatine officials, finding the insurmountable opposition of the nobility. Both the Queen Mother as María Ana de Neoburgo worked to make lead to the fall of the Minister and presented to the King a memorial of charges against him. Carlos II not decided to dismiss him, but the pressures of her mother finally got his goal and the 27 June 1691 Oropesa was separated from the Government. Oropesa, however, had shown signs of higher intelligence in International Affairs, and led to a close alliance with Austria, Sweden, and the German Empire, which was reflected in the Constitution of the Ausgburgo League in June 1680. In 1689 Luis XIV went to war against the League, attacking Flanders and Catalonia by land, while sea the French fleet harassed the Mediterranean coasts and the West Indies. In 1690 the French army submitted hard to allies in the bloody battle of Fleurus, initiating a strong French offensive in the Netherlands to the Spanish and English armies were unable to contain. In Catalonia, the war was also unfavorable for Spain, since he/she lost the towns of Camprodon and Urgell. This was the military situation when Oropesa was dismissed. The replacement of Oropesa started again the courtly factional fighting. The two Queens had two candidates. As it could not reached an agreement on the appointment of a Prime Minister, a Government Board consisting entirely of characters from the Austrian party was created. This Board reached great unpopularity (was known as the "Board of liars", because hiding the location of the war against France). In front of it, was the "company of the righteous seven", group of nobles and examiners who argued for the implementation of a profound institutional reform and by the signing of a separate peace with Luis XIV, which put an end to a disastrous war. These tips were dismissed by the King, under the influence of the Austrian party. Meanwhile the war continued on all fronts with serious setbacks for the allies and especially for Spain in the catalan front. French troops occupied Barcelona in 1697. The continuous defeats of the League gave way to peace negotiations, which concluded with the agreement of Ryswick in 1697. Luis XIV returned all conquests made in the Spanish territories after the peace of Nijmegen. The French monarch so generously agreed to return the occupied territories because in Europe had begun the diplomatic movement to settle the Spanish succession, when it became clear to Carlos II died without heirs. Before reaching the age of majority, the issue of the marriage of the King took priority, because it was feared that Carlos might soon die or could not engender given his physical weakness. In principle it was the ability to marry the daughter of the Emperor Leopold, following the traditional line of inbred marriages of the Habsburgs. The Regent Doña Mariana and the count of Harrach, imperial Ambassador at the Court of Madrid were in favour of this link. However, the youth of the Princess had delayed too long the consummation of the marriage and the birth of the possible offspring, so this option was dismissed. After the peace of Aachen in 1668, when foreign policy dominated the French party, it was a Princess of the House of Bourbon. Two candidates were: María Teresa, daughter of Luis XIV and the Spanish infanta of the same name, and María Luisa, daughter of the Dukes of Orleans. Among them he/she preferred to María Teresa, but the Princess died in 1672, and on the other hand, for then the precarious peace had already broken with France. This was to think of a traditional wedding with a German dynasty. 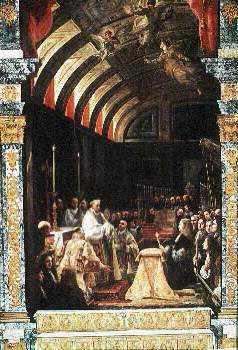 The marriage of the King was however moved from priority issues, with little foresight, during the Governments of Valenzuela and don Juan José de Austria. Once restored peace in Nijmegen in 1678, don Juan decided, by your account, the marriage of his brother with María Luisa of Orléans, niece of Luis XIV. The marriage proposal was very well received by the monarch French and soon the capitulations, agreed once the Pope Innocent XI gave the expenses necessary for being the couple very close relatives. The nuptials were held at Fontainebleau in August 1679. The contemporary sources say that the King fell rendidamente in love with his wife and that this quickly gained great influence at the Court, although his intervention in the Affairs of State was unimportant. María Luisa was used as a pawn of the interests of Luis XIV in Spain. His early death in 1689 (some considered suspicious) left newly opened the marriage problem, while the lack of offspring of the King became a matter of pressing both in Spain and in European courts. Ten days after the death of María Luisa, the State Council urged Carlos II to marry as a matter of urgency. In March 1689, marriage agreed the King with the Princess María Ana de Neoburgo, of the House of Austria. This soon became aware of the improbability that a King's son was born him and surrendered to the intrigues that were woven in Europe with a view to the succession of the Spanish throne. Since his arrival in Spain in 1690, María Ana occupied a central place in political events, favouring an approach to the Empire and a further deterioration of relations with France, which would end at the outbreak of a war of continental dimensions. The problem of succession to the Spanish throne became the most important issue in Spanish politics as a European. 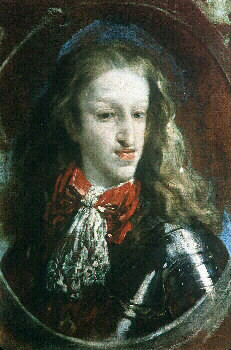 During a serious illness of the Kings, in September of 1698, Cardinal Portocarrero got Carlos II appointed as heir to José Fernando de Baviera, great-grandson of Felipe IV, while the King got him that, in case of death, a bipartite Regency integrated formed by Portocarrero and Oropesa. However, María Ana de Neoburgo, on whose backs these plans had been made broke the regio Testament and got the cancellation of such provisions. José Fernando de Baviera died in February 1698 and this produced the final confrontation between matches Austrian and French, who respectively supported Archduke Carlos of Austria and Felipe of Anjou as candidates to the throne. The Austrians had the support of Queen María Ana and Oropesa and had as their ringleader Ambassador Harrach. The French, represented by Ambassador Harcourt, had supports more substantial, as in Cardinal Portocarrero, President of the Council of State. When in may 1699 Oropesa was away from power as a result of the serious riots that the shortage of food produced in Madrid, Portocarrero could act at will. In this context took place the famous issue of the hechizamiento of the King, in whose orchestration Portocarrero was involved. Although rumors of the enchantment of the King ran by the Court since the beginning of the reign, from 1698 the subject overcame the palace walls and became public domain. The own Carlos II, convinced of its hechizamiento, requested the Inquisition that he/she find out the causes of their evil. The Royal confessor, fray Froilan Díaz, of the French party, according to the Inquisitor Rocaberti, called a famous Asturian Exorcist, fray Antonio Álvarez Argüelles, with the Commission ask the devil if the King was, indeed, spellbound. Apparently, Lucifer replied that Yes and the Exorcist has determined that, as a remedy, the King take daily in fasting a quad of blessed oil. The King meekly underwent such prescription, that must have been a determining factor in their rapid physical deterioration. Suspiciously, the demons of the father Argüelles spoke German. The Austrian party is upset and from Vienna was sent a Capuchin, fray Mauro de Tenda, so that at the same time he/she questioned the demons which, of course, were all French. The hechizamiento of the King was a ludicrous scandal both in Spain and in the European courts. Finally the Queen María Ana de Neoburgo, which was not well in the manifestations of the demons, decided to put an end to so much trickery and ordered imprisoned the Royal confessor and Tenda, which had to cope with an inquisitorial process. Parallel to these events, in Europe it debated hard about the succession of the Spanish throne. In 1698 French and Dutch signed an agreement whereby José Fernando de Baviera, appointed by Carlos II, heir would be Spain, the American colonies, the Netherlands and Sardinia, the Archduke Carlos de Austria, the Duchy of Milan and the Dauphin of France the rest of Italian territories and Guipúzcoa. Since Luis XIV started a hard harassment to the Spanish monarchy that remained permanently in tension to the Madrid government. Successive disasters in foreign policy even further weakened the position of the Governments that followed in power. In 1700 the intense debates and the apparently imminent death of the King did tip the Council of State by the French succession of Felipe of Anjou, which supported the papacy. October 11, 1700 Carlos II, already very broken health and at the request of Cardinal Portocarrero, named successor to French suitor. With the prohibition of which the crowns of France and Spain arrived to join. Created a Board in charge of the Government after the death of the King, while the new King is taking charge of the situation. Three weeks later, on 1 November, died the last of the Spanish Habsburgs, four days after reaching the age of forty. He/She was buried in El Escorial. Adoration of the sacred forms by Carlos II. Claudio Coello. El Escorial. Classical historiography has drawn the Spain at the end of the 17TH century as a nation in deep crisis and internal decomposition whose decline would reach its zenith in times of Carlos II. Often presented to the monarch as the embodiment of the tragic destiny of the Hapsburgs, gunned down by a family degeneration parallel to the breakdown of his empire. Its sad figure, which contrasts with the of the bizarre Carlos I, can be seen in the splendid portrait that it made Claudio Coello to the chapel of El Escorial. However the contemporary historiography has reviewed the concepts of glory and crisis of the Spanish monarchy and the reign of Carlos II is no longer seen, in good measure, as dreg of the chalice of Spanish decadence. At the same time the Catalan historiography has made him the best King of Spain, since, after the major insurrections of 1640, carolina monarchy scrupulously respected the privileges of communities in what some scholars have called a "neoforalismo", represented by Juan José de Austria. From 1680 detected numerous indications of recovery economic and demographic, the exit to the crisis experienced by Spain in the second half of the 17TH century. It is possible to so check the image of a King whose inability to address the issues of Government is unquestionable, but that patriotic nostalgia of the doubtful Spanish splendour has unjustly become laughable symbol of Spanish decadence. 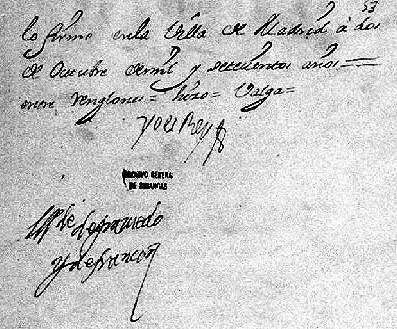 Last page of the testament of King Carlos II. CARLO POYATO, j.: Carlos II the Bewitched. Barcelona, 1992. GARZON couple, M.: The Hacienda de Carlos II. Madrid, 1981. KAMEN, H.: The Spain's Carlos II. Barcelona, 1987. MAURA GAMAZO, g.: Life and reign of Carlos II. Madrid, 1990. PFANDL, Ludwig. Carlos II. Madrid, 1947. BELÉN SÁNCHEZ, J.A. : The minor Austrias. The Spanish monarchy in the century XVII, Madrid, 1996. AYAN SANZ, C.: The bankers of Carlos II. Valladolid, 1989.